Sensei, I whispered. Sensei, I can’t find my way home. But Sensei wasn’t here. I wondered where he was, on a night like this. It made me realise that I had never telephoned Sensei. We always met by chance, then we’d happen to go for a walk together. Or I would show up at his house, and we’d end up drinking together. Sometimes a month would go by without seeing or speaking to each other. In the past, if I didn’t hear from a boyfriend or if we didn’t have a date for a month, I’d be seized with worry. I’d wonder if, during that time he’s completely vanished from my life, or become a stranger to me. Strange Weather in Tokyo is the story of Tsukiko, a woman in her late thirties, who re-encounters one of her old high-school teachers (‘Sensei’, a man thirty years or so her senior) in a sake bar. They meet by chance one evening and over the course of the following months a connection develops as they seek solace in food, beer and sake. Their relationship feels quite unstructured; they rarely make arrangements to reconnect and weeks can pass before their visits to the sake bar coincide. They are both essentially quite solitary individuals, but there’s a sense that they gain some comfort from these encounters. The story is told through the eyes of Tsukiko and there is an almost dreamlike, slightly surreal quality to the narrative as it unfolds over the course of the novel. We follow the couple as their relationship evolves and deepens; it starts with shared moments in the sake bar and develops to include trips to a local market, a mountain hike to collect mushrooms and a cherry blossom party. There are some wonderfully-observed details in these passages; nature features as a theme and we see the changing of the seasons as the months pass. Another passage features a description of Sensei’s house with its collection of railway teapots and this adds to the slightly offbeat tone of the novel. In a poignant scene Tsukiko attempts to peel an apple whole, in one long curly piece (she had impressed a former boyfriend some years ago by managing to keep an apple skin intact). This time, however, the apple skin breaks part way round and Tsukiko bursts into tears as the broken peel comes to signify her loss. Tsukiko had been very much in love with this former boyfriend, but she seemed unable to express her feelings or demonstrate she cared for him. I loved the delicate, nuanced quality of the relationship between Tsukiko and Sensei. There are times when they seem to communicate predominantly through feelings, using few words, soundlessly conveying deeper emotions and intimacy through thoughts and gestures. The unstated, yet deep nature of their relationship contrasts somewhat with Tsukiko’s brief flirtation with an old classmate from school (Kojima) whom she bumps into at the cherry blossom event. There’s a sense that Tsukiko is only content and able to settle in some way when she is with Sensei. I found this to be a beautifully-written and moving novel, expertly and sensitively translated by Allison Markin Powell. I think it will stay with me for some time; the ending in particular brings real emotional weight to the story of Tsukiko and Sensei’s relationship. I read this book last year and revisited it in January for Tony Malone’s focus on Japanese literature (January in Japan) and can recommend it to anyone interested in a quietly powerful book about loneliness, connections and the uncertain nature of relationships. This review was originally published as a guest post on Tony Malone’s January in Japan blog (27th January 2014) and Tony has kindly granted his permission for me to republish it here. Strange Weather in Tokyo has been shortlisted for the Independent Foreign Fiction Prize (which I’ve been shadowing along with a group of book bloggers). Other members of the IFFP shadow group (Stu, Tony Malone and Tony Messenger) have also reviewed this book (published in other markets under the title of The Briefcase). And here’s another review from Naomi at The Writes of Women. Just click on the links to read their thoughts. 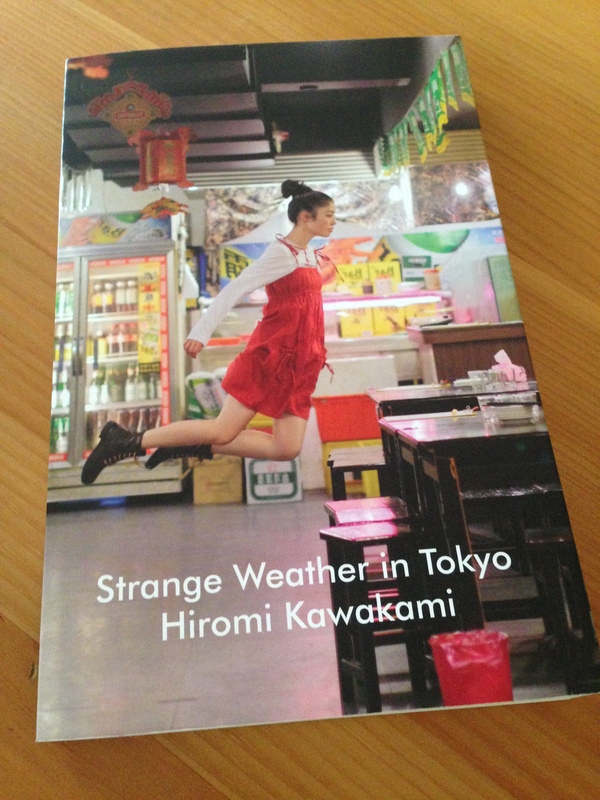 Strange Weather in Tokyo is published in the UK by Portobello Books. Source: personal copy. This entry was posted in Book Reviews, Kawakami Hiromi, Women in Translation and tagged #ReadWomen, #ReadWomen2014, #TranslationThurs, Allison Markin Powell, Book Review, Fiction, Hiromi Kawakami, IFFP, Japan, Literature in Translation, Portobello Books, Women in Translation on May 6, 2014 by JacquiWine.